• A scenic boat ride to our session area[/vc_column_text][vc_custom_heading text=”Picture Package” font_container=”tag:h2|font_size:30px|text_align:left|color:%23000000″ google_fonts=”font_family:Fugaz%20One%3Aregular|font_style:400%20regular%3A400%3Anormal”][vc_separator color=”turquoise”][vc_column_text]Relive every thrilling hydo jetpack experience! Capture your moment with our picture package for $35. Our professional photographer will give you over 100 photos and you keep your 4GB SD card of pictures. [/vc_column_text][vc_custom_heading text=”What is the Jetpack and why do it with us?” font_container=”tag:h2|font_size:30px|text_align:left|color:%23000000″ google_fonts=”font_family:Fugaz%20One%3Aregular|font_style:400%20regular%3A400%3Anormal”][vc_separator color=”turquoise”][vc_column_text]An ironman like experience is what you will get when using a hydro powered Jetpack. 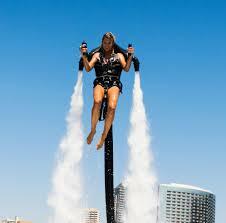 Miami Jetpack is an entertaining and safe activity which is suitable for both kids and adults. In order to ensure your safety, we will provide you with a certified flight instructor who will make sure you had an excellent Jetpack experience. 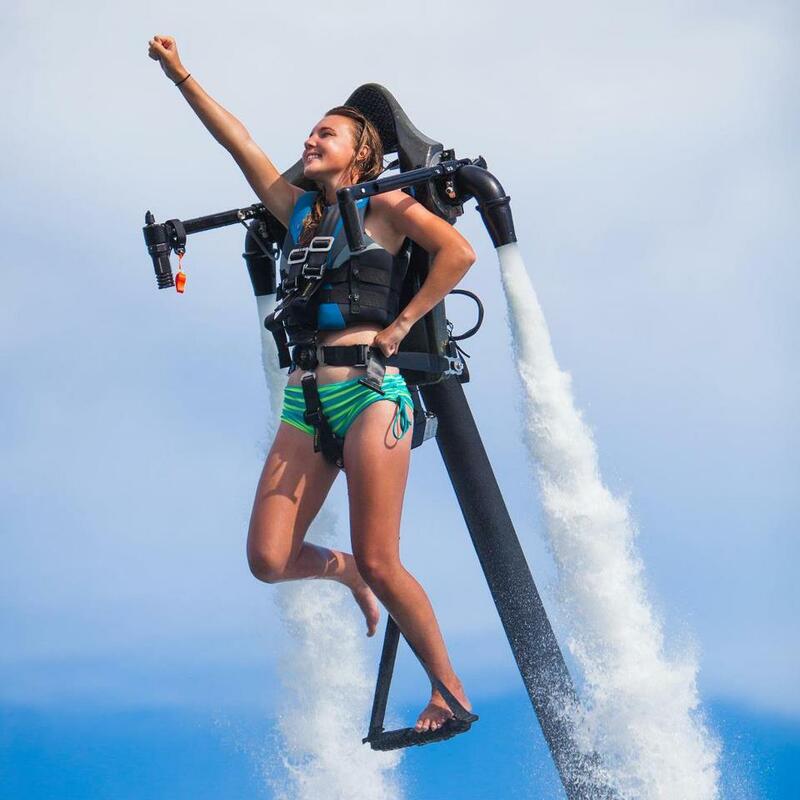 If you are a first time flyer, we highly recommend you to try Flyboarding first, the Jetpack is more advance and requires the rider to have prior experience with the Flyboard. 13 years old is our minimum age required. 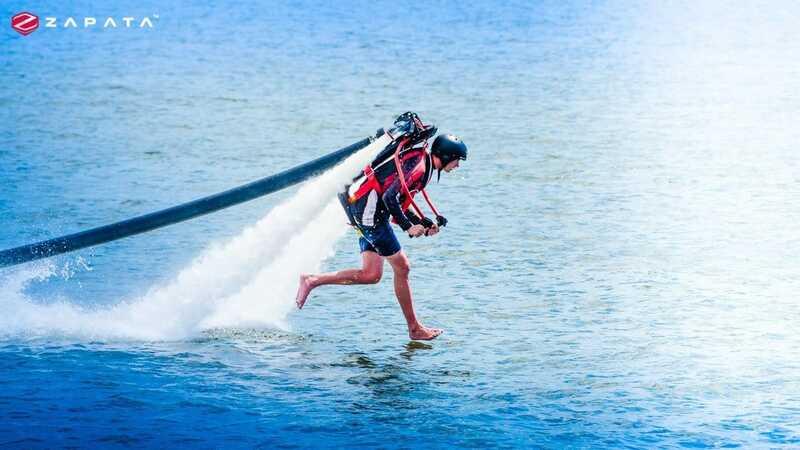 Flyboard or Jetpack for the first time? 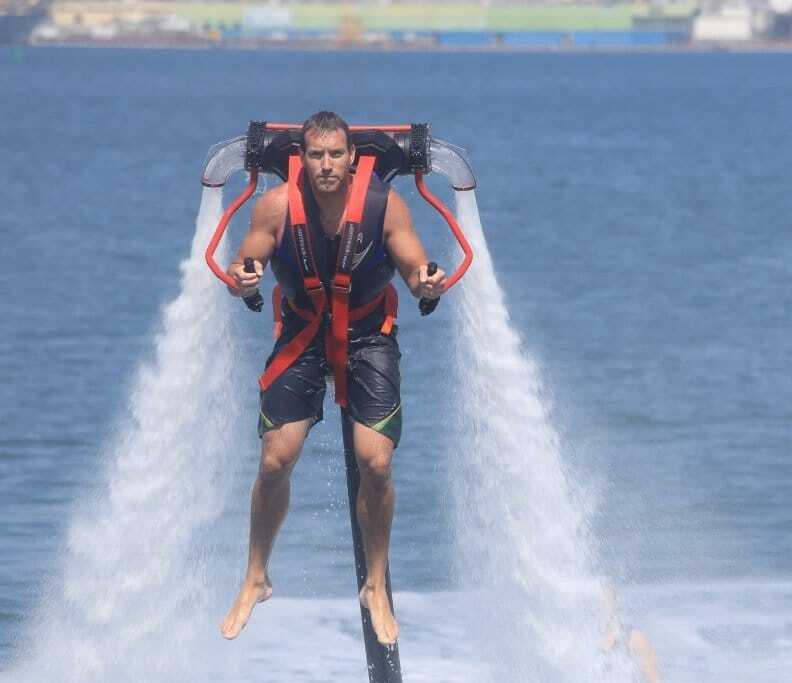 Simple, Flyboard all the way, that you are a beginner or pro, Flyboarding is the way to go, its simplicity of use and the wide range of amazing tricks that can be done with its technology is incredible. Jet Pack is very difficult to operate, harsh on the body because of its size, and has a very limited range of tricks that can be done with it. Of course, the rider will be given a quick break down of how the process works, including full instructions on how to control the board. During the full session, an instructor will be working one on one with the rider to give them the best possible advice on how to get off the water and even some tips to help them perform their first sets of tricks! The hose is 50 ft long, so technically you could go 50 ft up in the air. However, for safety reason, we limit the height to about 20 feet. How many can go at the same time? We usually do one flyer at a time, however, we are able to operate 3 setups at a time during busy times. Is it free of charge to watch? Yes, we do not charge spectators to watch or take pictures. We operate the flyboard/ Jetpack right off the dock of our establishment, where the water is nice a calm to learn for the first time! You will get fully wet! So wear a bathing suit; no need for a wetsuit with this Miami weather. For girls, if you decide to wear a bikini make sure it’s a tight fit and won’t slide down when getting pushed in the water. Like all extreme sports, there are risks, however, they are very low and we have never had any serious injuries. The rider will be provided a life jacket and helmet, the board floats, everything floats. Our instructors will put first times flyers only a couple of feet in the air at first until they gain better understanding and control of the flyboard. Starting low increases the confidence of riders, and our instructors will progressively increase throttle/ height according to the riders skill level.